Data center and facility managers responsible for maintaining the temperature of a server room need to be aware of the fact that a portable air conditioner can be the best option for keeping a small server room at an ideal temperature. If it is difficult or costly to gain more cooling from the central air conditioner, then a portable air conditioner can provide the immediate relief and temperature control a small server room will need to off-set the heat generated by the server room equipment. Portable air conditioners are a superior option when compared to investing the resources necessary to add on to the existing ventilation and cooling system. Even if the server room is tied into the overall central cooling system, it can still be a more economic decision to utilize the benefits of spot cooling -- especially on nights and weekends when the central system may be shut down. 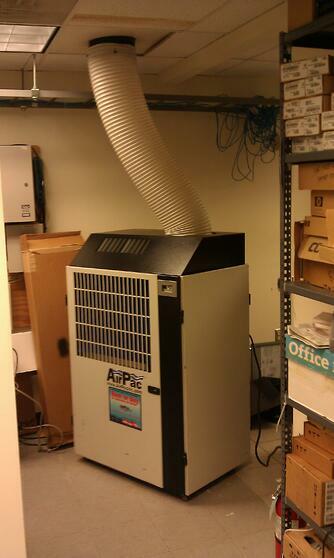 Instead of running the building’s central air system to keep the server room cool, it can be less expensive to invest in a low-cost, energy efficient portable air conditioner. A spot cooler can control the temperature of a specific area, allowing for a more constant temperature in a server room. If you have mission critical data or equipment in your server room, you need to have a back-up cooling plan. Portable air conditioners are ideal for emergency cooling. You can have the units installed in the server room and have the thermostat activate the unit if the temperature rises beyond a pre-set level. Or, you can have the units on stand-by to wheel in place and start cooling when needed. Portable air conditioners can also be rented for your planned and emergency cooling needs. If you have a server room, you'll benefit from having a spot cooler on hand for primary, supplemental and emergency cooling. Odds are, you may even have more than one server room or telecommunications closet. That's when economies of scale increase and owning a spot cooler makes even more sense. But fear not, if you need to rent a portable air conditioner, that's not a problem. Just be sure to choose a rental company with reliable equipment and great service.